Old-Fashioned Breakfast | Overstuffed Sub Sandwiches | Hand-Packed Burgers | Soups Made from Scratch & More! 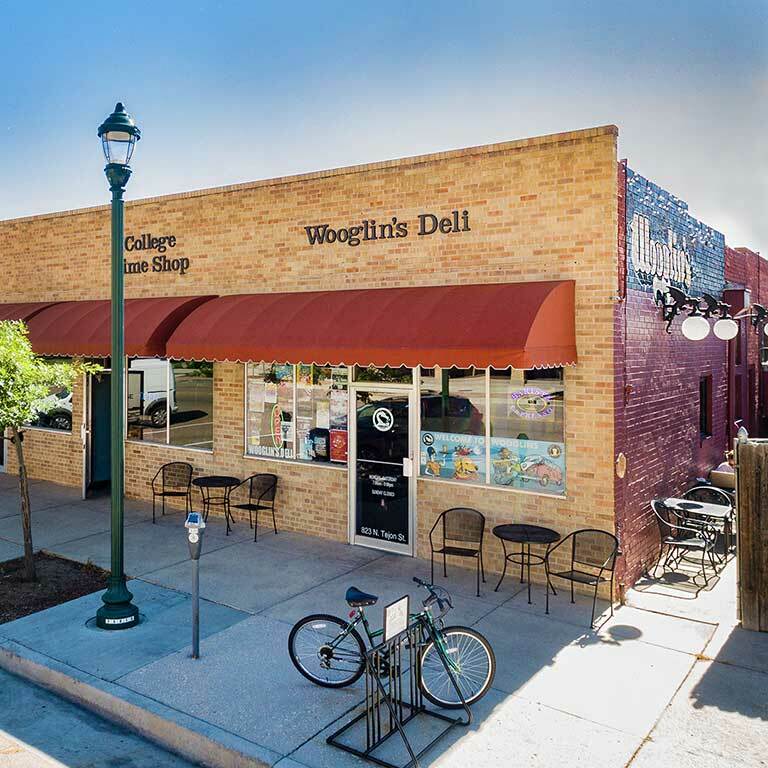 Wooglin’s Deli & Café is a local, independently owned and operated restaurant close to the heart of downtown Colorado Springs. We are dedicated to creating community by providing a casual, welcoming environment and homemade flavors made from scratch. Located across from Colorado College on the corner of N. Tejon St. and E. Cache La Poudre St, Wooglin’s is a quiet spot for eating, relaxing and connecting. Wooglin’s serves breakfast, lunch and dinner; brews locally roasted coffee and espresso drinks and makes in-house, from scratch, quiches, muffins and desserts. Breakfast Burritos, Pancakes, Traditional Breakfast Platters, Quiche, Bagels, CAfe Drinks, Coffe and More! 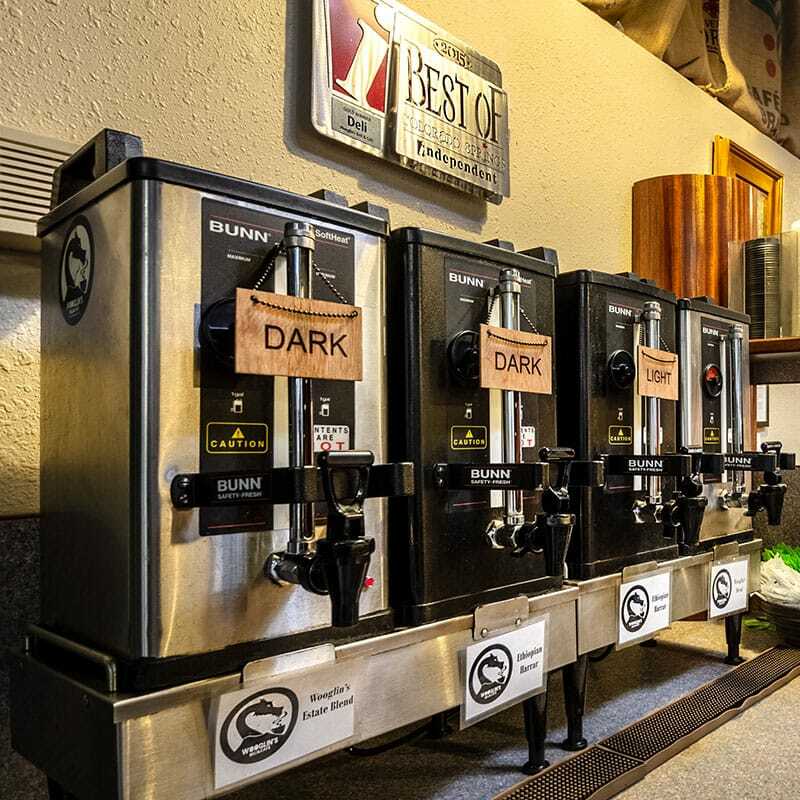 Noted as the best coffee in Colorado Springs, Wooglin’s self-serve coffee bar and full specialty coffee menu is a favorite amongst the community. Whether you need a quiet spot for a casual business meeting or you’re simply catching up with a few friends, our comfortable inside and outside seating areas offer a welcoming retreat. Wifi is available for all customers. Wooglin’s makes their chips in-house, making your lunch or dinner more delicious. Wooglin’s believes home-made doesn’t stop at just the sandwich. Taste the difference! Wooglin’s hand-crafted desserts and pastries are a perfect treat any time of day, and they go perfectly with our coffee, tea and espresso-based drinks. Wooglin’s bakes their wholesome breads fresh every day, so you can enjoy eating a more delicious sandwich. “I have frequented Wooglins with a dear friend of mine every Saturday morning for approximately 15 years, if not more. It is the type of place that makes you feel part of a family, maybe similar to the sitcom Cheers. I am certainly not the only one who thinks this because the “regulars” are many and varied—from college students to retirees to prominent figures in our community. The friendliness and professionalism is top-notch! The food is consistently excellent and fairly priced. With that said, what more could you ask for? Give it a try and you’ll be hooked…” ~Carolyn R.